Reflecting reality into the proverbial phrase, “When life gives you lemons, make lemonade,” author Veronica Chinasa Osunwa shares how God moved her from victim to victor, tears to cheers, nobody to somebody, from grass to grace, disappointment to appointment, and from a failure to a Master of Business Administration degree holder. Despite a humble, poor and downtrodden beginning, Osunwa shines a ray of hope. In “From Disappointment to Blessing” (published by Balboa Press AU), she narrates how her parents fled from war and Osunwa was shuffled through her family like a worn hand-me-down until she returned to her village seven years later, a penniless outcast. “Most of the ideas arose from people I met in work settings who hit rock bottom and attempted suicide following disappointment,” Osunwa explains the book’s inspiration. She encourages others to see disappointment as a blessing in disguise and to never allow yesterday’s issues to overshadow tomorrow’s dreams, destiny and visions. 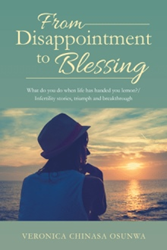 Filled with important Christian themes, “From Disappointment to Blessing” narrates Osunwa’s story as well as the stories of others to demonstrate how one can overcome obstacles, particularly if one’s faith is placed in God. Veronica Chinasa Osunwa is a multi-award-winning Christian songwriter, whose songs have appeared in Catch a Rising Star Edition of Paramount Song Nashville in USA. She is an inspiring, motivated, positive writer with an infectious smile and holds a Master of Business Administration degree. Osunwa is the CEO of Good News Music, and currently works for the Disability Service Commission (Department of Communities). She is married to Rev. Samuel Osunwa, and is blessed with both spiritual and biological children.